This week’s episode picks up from last time, with Yamato in the hospital bed. He ends up stabilizing, but not before all of the girls profess their love for him. 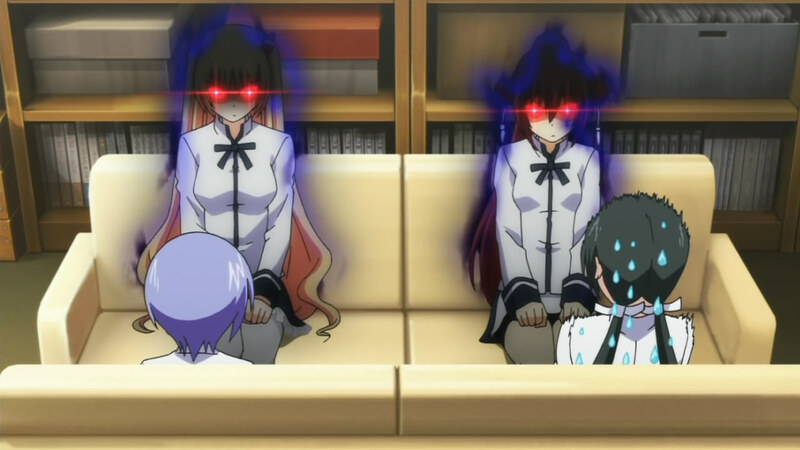 While the girls give each other the evil eye, Yamato talks to Cookie about the fight. When he points out that Tachibana seemed to know their moves, Cookie tells him about Saki Mimori, who was also enhanced. Momoyo continues to look for Tachibana, but Ageha tells her to stop, insulting her tenacity. Back in the hospital room, everyone is fighting over Yamato, but they are interrupted when Cookie sees that Tachibana is causing havoc in the town. Everyone rushes out to avenge Yamato, but Momoyo reaches her first. The principal heals Yamato and begs him to stop Momoyo as the episode ends. Ok…let’s ignore the scene where everyone was in a nurse’s outfit (no matter how awesome that was). Interesting stuff so far. Definitely looks like things are preparing for a final episode. Not sure whether I like the speed that they jumped into the final arc, but I’ll live. More next week, I suppose.